Book a School or Library Visit with Rebecca! Rebecca Behrens is the author of the middle-grade novels When Audrey Met Alice, Summer of Lost and Found, and The Last Grand Adventure. She has also worked as a production editor of children’s books at a major publishing house, so she loves talking about the entire process of how a book is created–from messy first drafts to reprints. Her historical short story “Thatagirl!” appeared in the November 2014 issue of Scholastic’s classroom magazine Storyworks and as “Girls Can’t Play” in the January 2015 issue of Scope. Her realistic fiction, “Lost & Found,” appeared in the February 2016 issue of Scope, the March 2017 issue of Storyworks, and in Storyworks, Jr. in 2018. Her historical short story “What We Left Behind” appeared digitally in Scope in spring 2017. 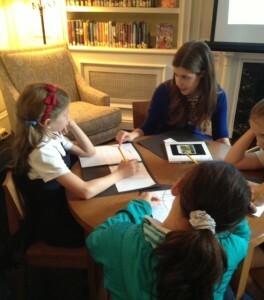 Rebecca’s presentations and workshops are great for young readers in grades 4-8. 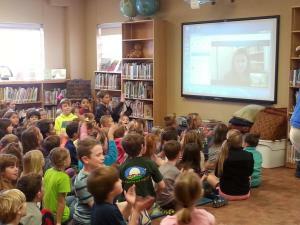 She’s also available to speak to high-school students as well as adult groups of teachers, librarians, and parents. Rebecca has also presented at the Wisconsin Library Conference in 2014, the AASL National Conference in 2015, and nErDcampNJ and nErDcampLI in 2017 and 2018. Fees: They’re negotiable (I know how meaningful it is to connect young readers and writers with authors), but they generally range from $300 for one local (tri-state NY area and the state of Wisconsin) presentation to $1200 for an out-of-state full-day visit (multiple presentations, lunch, and signing), plus expenses. Rebecca is available for complimentary Skype visits with book clubs (of all ages) that are discussing When Audrey Met Alice, Summer of Lost and Found, or The Last Grand Adventure. Check out the book-club discussion guides here, here, and here. Contact Rebecca for more information.